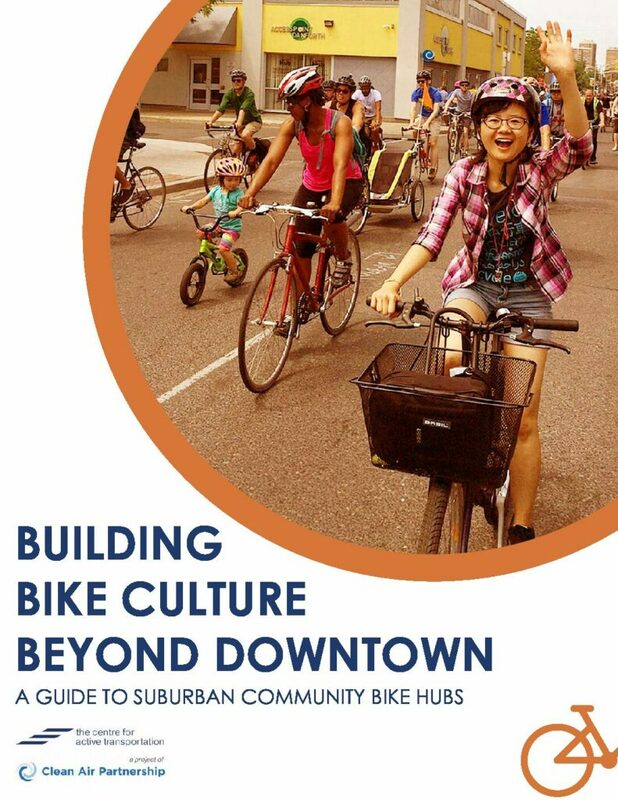 Building Bike Culture Beyond Downtown: A Guide to Suburban Community Bike Hubs (download PDF file) sheds light on how Scarborough Cycles, an innovative project launched and led by The Centre for Active Transportation (TCAT) between 2015 and 2018, tapped into the potential for cycling in a suburban district of Toronto. Over three years, this community bike hub project repaired over 2,000 bicycles, led over 1,000 people on rides, and trained over 200 people in cycling skills – all in a suburban community with next to no bike lanes and only one bike shop. The report describes how to launch a community bike hub – welcoming spaces where people can learn more about cycling, meet other people who cycle, and go cycling together – to spark cycling adoption. Hubs offer programming such as do-it-yourself bicycle repair, bicycle loans, and guided rides to encourage cycling in an area where few trips are made by bicycle. TCAT’s community bike hub approach is based on a targeted, four-step approach which other suburban communities can replicate. The TCAT team adapted proven social psychology strategies, such as those used for quitting smoking or reducing energy consumption, to encourage and sustain behaviour change for cycling. The report lays out the four-step process for others to use: 1) find the neighbourhood, 2) identify local barriers, 3) remove barriers and start cycling, and 4) keep cycling.